A Global Capacity Building Workshop every year is being held at the Navdanya Biodiversity Conservation farm for citizens’ organizations and movements on seed saving, seed exchange and participatory breeding and the links between Seed Sovereignty and Food Sovereignty and issues of Intellectual Property Rights, Patents, Seed Monopolies and Farmers Rights at Dehradun with eminent scientists and environmentalists like Dr. Vandana Shiva, Dr. Salvatore Ceccarelli, Dr. Mira Shiva, Dr. Sultan Ismail, Andre Leu, President of IFOAM, Ronnie Cummins, Directors & Co-founder Organic Consumer Alliance (OCA ), Will Allen, Dr. JC Tarafdar, Dr. Vir Singh, Dr. V.P. Uniyal / Preeti Virkat, Dr. Vinod Kumar Bhatt, Dr. Av Singh, Mr. Hari Raj Singh, Ms. Marilyn McHugh, Mr. Chris Kennedy, R.S. Rawat, D.S. Negi, Bija Devi and the Navdanya team. More than a dozen specialists and 56 participants from all over of the world are joining this program this year. 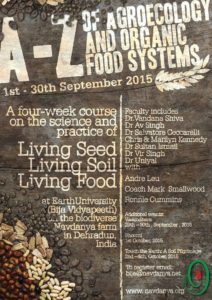 The global capacity building workshop (A-Z on Agroecology) will conclude with the annual Earth Festival (Bhoomi Maati Maa: the Festival of The Living Soil) organized by Navdanya in New Delhi on 01/10/2015. Week 1: Agroecology – What is Agroecology? Introduction to Agroecology: A systems understanding of agiculture and food systems: relationship between Soil, Seed, Biodiversity, Climate, Health & Nutrition. Week 2: Living soil – What is living soil? The Soil Food Web, Renewal of Soil Fertility; composting and other methods to rejuvenate living soils. Week 3: Living Seed – What is living seed? Seeds and biodiversity, difference between traditional open pollinated seeds, Green Revolution varieties ,hybrids, GMOs, Why save seeds, participatory and evolutionary breeding, seed conservation, creating community seed bank and seed libraries. Week 4: Living Food Systemsn – What is living food? The health hazards of the industrial food system-pesticides,GMOs ,Junk food,Health, nutrition and ecological agriculture; the economics of local organic systems vs industrial global systems; Economic diversity and biodiversity of markets, issues of certification and participatory gurantee. Week 5: Transition strategies from destructive, extractive agriculture to regenerative agriculture and Living Food Systems: Soil, Food & Climate Change, Soil, Food & Health, Soil, Food & Democracy. No Comments to "A-Z of Agroecology and Organic Food Systems – 2015"